I have been extremely busy so I am sorry for slacking on the blog and yes on YouTube too! I have not only been busy with prepping for the Olympia but for my wedding. I went to Austin this last weekend and did my my dress fitting for my bridal gown and also practiced posing with my coach and teammate. Then I left super early the next morning to go to work and get all my clients in because I will be gone the rest of the half of the week. Enough about that lets chitty chat about tan, makeup , body hair etc..
Q:What do you do as far as your skin is concerned…like shaving or waxing? A: Shaving most of the time but sometimes bikini waxing. Q:how do you deal with who make fun of you when you take your meals to their house and when you go out with friends? A: This is something that I am used to by now. I have been doing it for about 3 1/2 years now but at first I used to get emberassed. Why should you feel emberassed though? Now I always let my friends know before and if they laugh I just laugh with them. They are used to it though. I always tell them why it benefits me. Some of my friends since then have been inspired and now do the same thing. Q:How do you prep for tan and get it just right? Especially with your makeup!? A: When it comes to tanning I tan in a tanning bed for the month of my show to build a base tan.I make sure I exfoliate a few days before the big event. 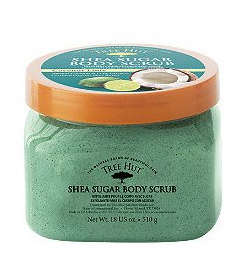 I like Coconut lime Body scrub from Tree Hut! Also you can make your own scrub. I used to do my own tan until my pro debut I had a tan disaster. It was streaky and I ran out of my tanning solution. Thank goodness for Jantana, she came to the rescue. Ever since then I have always used Jantana. It’s not cheap but it’s worth it. It takes 15 minutes and then your super dark for stage. Mix together Sea Salt, Coconut Oil & Coconut Milk in a large bowl. Add in additional coconut milk (by tablespoon) to achieve desired consistency, if needed. Mix well, separate into individual jars, and let sit for 30 min – 1 hour. Enjoy ! Q:Do you get darker makeup for stage, if so how do you match the color? A: I use NC45 by MAC Studio Fix Fluid. I never get sprayed on my face . I think the color of the face should be slightly lighter but not crazy light. I also use a couple shades darker in powder and a lot of bronzer for contouring. 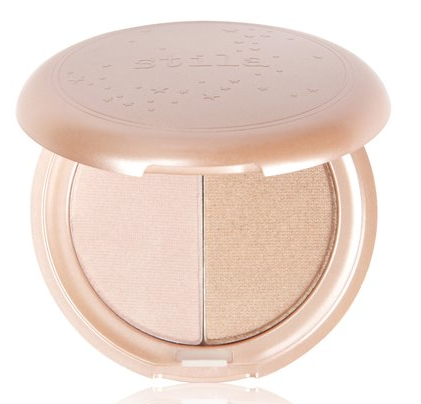 My must have highlighter for highlighting my cheekbones.Can’t live without it for stage! So now its time to get packed for the amazing weekend I am going to have! I am so friggin excited. I love all the Glitz n Glam in Las Vegas! I am just so thankful to be even getting the oppurtunity to step on the Olympia stage. I am so happy right now and can’t believe I am about to compete in my 2nd Bikini Olympia. I love reuniting with all the girls and all my fitness family. I feel very blessed right now. Thank you friends for reading my blogs and feel free to subscribe to it so you get notified everytime I publish a new blog.